Sonny Slide Maddams is a musician from Kingston, Ontario Canada. He has been playing music for over 40 years. A gifted slide guitarist, specializing in Roots and Blues music, he performs on such instruments as National Resophonic guitars, lapsteels, electric guitar, acoustic guitar, and banjitar. Sonny Slide’s music goes way back to the 1920′s. He plays the classics of the Blues masters, such as Robert Johnson, Blind Willie McTell, Bukka White, and Sleepy John Estes. 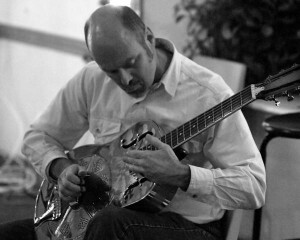 His repertoire also includes contemporary blues as well as many originals. Sonny favours playing his music on National Resophonic guitars and his Banjitar.